In 1974, dungeons tried to kill you. More than just the creatures inside, the walls and stone wanted your life. Dungeons changed when you looked away. (See page 8 of the original, brown book, The Underworld & Wilderness Adventures.) Doors closed on their own accord, and then you had to force them open. The dungeon helped its monstrous allies kill you. Doors opened for them. “Monsters are assumed to have permanent infravision as long as they are not serving some character.” (See page 9.) Dungeons had one-way doors and gently sloping corridors that lured prey deeper and closer to their deaths. Did the architects of these dungeons aim to foil explorers, or do the walls themselves bend to snare them? Was the door you went through earlier one-way or just gone now. Decades after the dungeons under Castle Greyhawk and Blackmoor launched the game, players grew interested in recapturing the style of those old megadungeons. But D&D had matured. Even players bent on remaking the past wanted to drop or explain the most preposterous elements: Monster populations that defied any natural order. Walls that changed between visits. Doors that opened and closed to frustrate intruders. So gamers looked for ways to account for the weird essence of those classic dungeons. Jason “Philotomy” Cone popularized the idea of a mythic underworld, which justifies the strange things that happen in those old dungeons by embracing the unreal as part of a place’s nature. For more about Jason’s concept, see page 22 of Philotomy’s Musings, a PDF that mimics the appearance of the original D&D supplements. 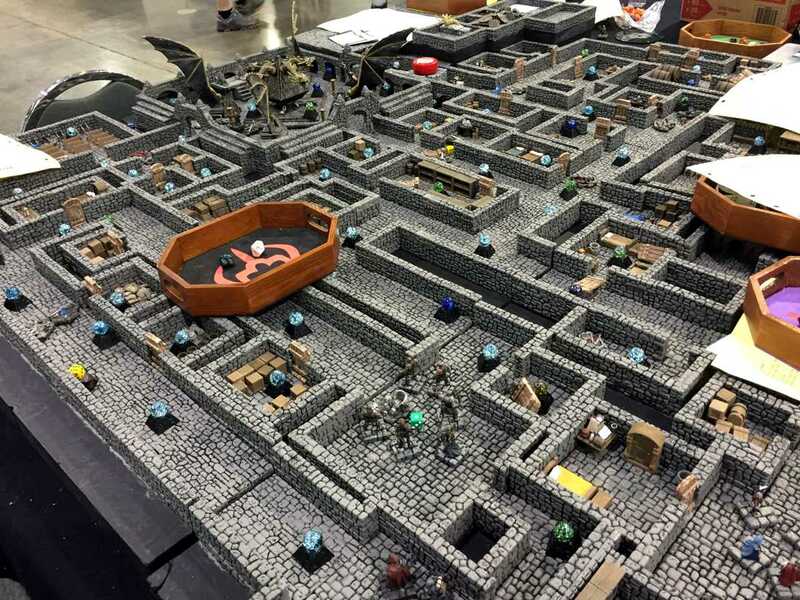 When Jonathan Tweet and Rob Heinsoo created their “love letter to D&D” in the 13th Age role playing game, the mythic underworld probably inspired their notion of living dungeons. If you like the living dungeon concept, in “I, Dungeon,” Mike Shea gives more ideas for a living dungeon’s motives and vulnerabilities. Some 13th Age reviewers found the living dungeon concept too fanciful. For them, the biological whiff of the concept of a burrowing dungeon felt too dissonant. For me, I think the mythic underworld resonates when it feels less alive and more haunted or cursed. Not cycle of life, but living dead. Stones that echo with so much hate and hunger and chaos that they mock life. To make such a dungeon frightful, avoid putting a face to the wickedness. The evil cannot manifest itself as a ghost in a sheet or as a personified “Dungeon Master” working controls at the bottom level. For inspiration of a haunted place look to 1963 movie The Haunting, which never shows ghosts but proves scarier for it. Or see the 2006 movie Monster House, which my kids couldn’t bear to watch through to the end. Imagine a place, perhaps one haunted by a massacre or some other legendary wickedness, perhaps one abandoned by god. This site devours all that is living and good that intrudes. It hungers to snuff more lives, so perhaps it pulls gems, gold, and lost treasure from the depths to lure more victims. Imagine a place that seems to summon—or perhaps even create—malign horrors to infest its halls. Imagine a place that waits to test the boldest heroes. This entry was posted in Inspiration and tagged 13th Age, Blackmoor, dungeons, Greyhawk, Jonathan Tweet, Mike Shea, mythic underworld, Rob Heinsoo. Bookmark the permalink. Nice post, David. An interesting philosophical exploration of the proverbial dungeon. I feel like there’s a place for both entities in the realm of RPGs–the logical, sensible dungeons that are merely pieces of a larger setting, as well as the semi-sentient dungeons that are essentially a living manifestation of hell. And it depends on the players as well, since some prefer more story and others actually favor the dungeon crawl above all else. I’m reminded of the “Living Wall” monster from AD&D 2e (originally from Ravenloft if I recall correctly, but it was in the Monstrous Manual). One of the “special” suggestions from Moldvay’s Basic Rulebook is “moaning room or corridor”, which could certainly lend itself to a wall that literally seeks to entrap player characters. Speaking of which, this idea of magical wall-altering was so pervasive, it actually made its way into the infamous DragonStrike VHS tape, where the Wizard says that “Taraptus uses his powers to shift the walls.” It’s kind of amusing to see a story explanation for randomness, so I chuckled when I found that old chestnut in the Temple of Elemental Evil board game. When I was a student in Toronto, I had a summer job stripping everything of value out of some buildings on the waterfront slated to make way for condos, including the provincial police headquarters and the Canada Malting silos. Everywhere you could see hints of the people who had worked there for decades – old newspapers, pinups in the lockers, fossilized jars of mustard. It’s those echoes of life that make a dungeon for me. As for the use of megadungeons overall, what I feels works well is a change of pace. If the party has been climbing mountains or hiking through forests, give them the option to go deep for a while. But gotta have a dungeon! Can also watch The 33 to appreciate the terror of being trapped two thousand feet underground. Overthinking any dungeon theme and trying to explain logically what goes on there has some serious disadvantages. The first flaw is that it suggests that a dungeon should be able to be understood – and that runs counter to the dread and utter mystery of the place. How -did- the Cave Bear find its way seven levels underground? How did the ancient or cursed relic come to rest unguarded within the depths of the catacombs? Who sabotaged the entryway and why? But more importantly, now that the maze is flooding, how will the characters ever, ever get out? For a look into the mind of classic gaming, I invite you to seek out my classic RPG – cast in the olde style. Knights on horses riding with banners across the sunset is a far cry from the original game where life was cheap and every roll of the dice was another chance to die at the hands of that which lurks in the dark. Thanks for the article, David. And as for the rest of you, hope to see you in The Realm.